After the publication of his best-selling novel, Joseph Heller usually chose to deny that any of his richly drawn characters were based on his actual war mates. After the publication of his best-selling novel, Joseph Heller usually chose to deny that any of his richly drawn characters were based on his actual war mates. However, to those who served with Heller in the 340th Bomb Group the novel’s characters were indeed recognisable; from the hard-drinking, vengeful, and disillusioned Chief White Half Oat; young, sliced-in-half Kid Sampson; shrieking, frenzied Hungry Joe; to Colonel Cathcart, Doc Dreedle, Yossarian and that capitalist supreme, Milo Minderbinder. In this book we finally encounter the real men and combat missions on which the novel was based. Blending fact, fancy and history with full-blown original illustrations and rare, previously unpublished photos of these daring USAAF flyers and their Corsican-based B-25 Marauders, along with descriptions of the 340th’s real wartime events, the work includes twelve men of the Bomb Group relating twelve richly told tales of their own. Now all of the men upon whom Heller based his characters are gone. However, the last survivor, George L. Wells, was an extraordinary combat pilot and the model for Catch-22s Capt. Wren, and he is the common thread who weaves through this book, allowing the reader to truly feel the war and even thumb through George’s well-worn mission book describing attacks on Axis ports, ships, bridges, and the notorious Brenner Pass. Author Patricia Chapman Meder has been a professional artist in both fine and commercial art for the past 35 years,13 of them in Europe. 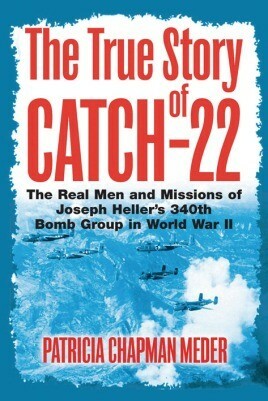 When Catch-22 was published it was quickly apparent that this book was based on the Bomb Group her father commanded in World War II. This true-life parallel book thus begged to be written.